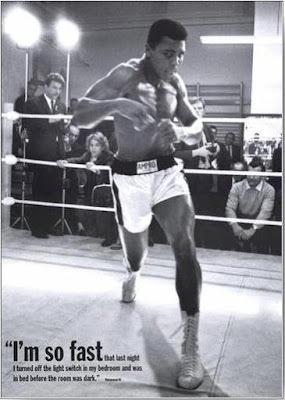 Muhammad Ali: "I am still the greatest"
This is the legend of Cassius Clay, The most beautiful fighter in the world today. He talks a great deal and brags indeedy, Of a muscular punch that's incredibly speedy. 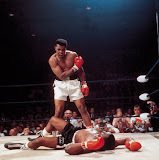 The fistic world was dull and weary, with a champ like Liston, things had to be dreary. Then someone with colour, someone with dash, brought fight fans a-running with cash. Yes, I'm the man this poem is about, I'll be Champ of the World, There isn't a doubt. Here I predict Mr Liston's dismemberment, I'll hit him so hard, he'll wonder where October and November went.